“THANK YOU FOR THE MUSIC” (ABBA 1977): this song (harmonized by three powerful voices) sums up Clear Lake Chamber Music Festival #9. The five days full of music, food and visiting was a heart warming time. Speaking of food, at the Coffee Concert: Serious Fun, the coffee and rolls (from Foxtail Café) were delicious and the café music which began on the old upright downstairs resonated with us all. The numbers that followed upstairs with the grand piano such as “The Alto’s Lament” had the audience chuckling. 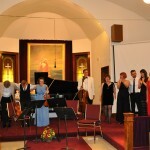 The range of works that graced the final concert in the series included two trios from Gilbert and Sullivan were performed by Chelsea Chimilar, Sarah Hall, and Naomi Forman, capturing the wit and sparkle of these late Victorian hits. The Festival also hosted the world premiere of Brandon University Professor Kenneth Nichols’ setting of a poem by Ezra Pound for piano, voice and flute. The sixties’ pop favorite “Goin’ to the Chapel” got the audience snapping their fingers and smiling at the fact they were, in fact, already in a chapel of sorts: the Erickson Lutheran Church, whose excellent acoustics delighted this reviewer. But it was not all “fun” music. The festival concluded with a Shostakovich Piano Quintet in G- a complex work spanning the spectrum of human emotions written during the Stalin regime when the composer’s very life was constantly in peril. The concert titles show both the scope and the depth of the music: Alexander Tselyakov in Concert (a bouquet of Romantic piano favorites superbly executed and masterfully performed as usual); Extravaganza; Jazz Concert; Romantic Afternoon; Triple the Fun; and the Festival Grand Finale. To avoid the long list of musicians that made this “event extraordinaire” possible we say only that they came from across Canada (even Saskatoon,Montreal. Calgary). The artists brought these works to life not only with music but also with commentary that often showed their personal connection to what they were performing. 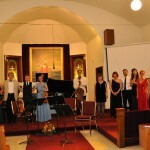 They were well-supported by a team, led by Alla Turbanova (who also provided an excellent performance on the piano), that enabled the music to flow. For those of you who are weary of impersonal festivals with mobs of people, dizzying light shows, and poor sound, the Erickson Lutheran Churchwas awash with natural light, beautiful stained glass and the transporting, transparent sound of the chamber musicians. The Clear Lake Festival offers our region a unique mix of accessible virtuoso performances from musicians you just can’t help but like. Watch for the tenth anniversary festival in 2015. Erickson has an August long weekend winner!